Home Blog Is change in the air for Scotland’s transport? Is change in the air for Scotland’s transport? A look at promises and progress across transport in the last six months. Often it seems like progress on air pollution and transport has been painfully slow. Transport is the most stubborn of sectors, with carbon emissions almost as high as they were in 1990, and unsafe levels of pollution. But there were a remarkable number of new promises made in September’s Programme for Government. There has been a seeming shift at local council level in the last six months too. Of course, new commitments now have to be properly delivered and further strengthened. The status quo is still that over two thirds of trips to work are made by car, compared with only 3 percent by bike and 10 percent by bus. We have a bus sector in crisis, and illegal levels of pollution across the country. But we have tangible promises to sink our teeth into now, and could be witnessing the start of a step change in the Government’s overall thinking on transport. Let’s compare the state of play from 6 months ago with what has now been promised. • Aberdeen, Glasgow, and Edinburgh Councils had expressed a willingness to have an LEZ. • More LEZs will be introduced by 2023 in other towns as required. In September, Glasgow Council passed a motion to introduce, in principle, an LEZ by 2018, that would eventually apply to all vehicle types. Defending the motion at Committee, Councillor Anna Richardson said, “I’m not going to apologise for wanting to be ambitious” – we hope to see some of that ambition fleshed out in the next six months and will be urging the Council to adopt an ambitious LEZ that targets buses, vans, and lorries from the outset. We have a mammoth task on our hands to influence what these LEZs will look like at the local level and are working closely with our local group in Glasgow as it will be the first Zone to launch. Crucially, LEZs need to be wide in area, scope and ambition, and Councils must be bold and ambitious in their plans. We’ve also recently been inspired by Oxford Council, which now plans to have the world’s first zero emissions city by banning petrol and diesel vehicles from the city centre from 2020. 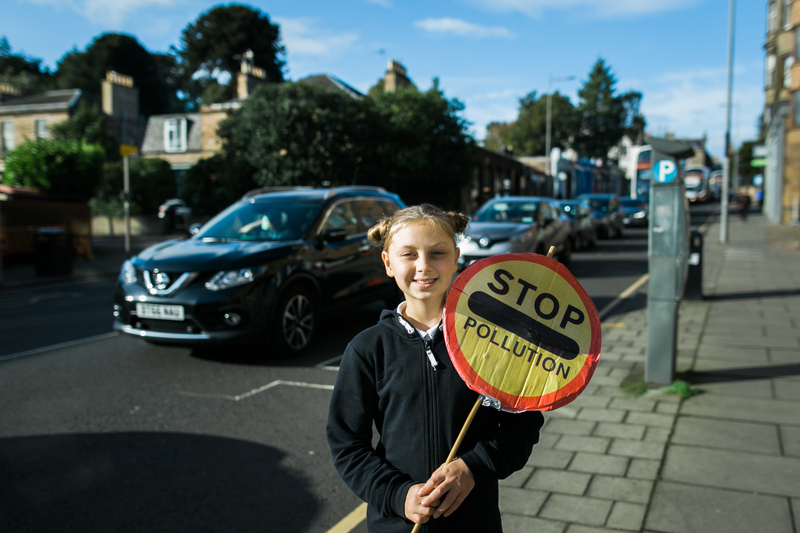 We want Councils and the Scottish Government to set plans for completely removing fossil fuelled vehicles from our town and city centres altogether. Not much. For years the bus sector has been in rapid decline across Scotland (with the exception of Edinburgh). In five years, private bus companies have cut routes by a fifth and increased fares by 19%. This dramatic decline is preventing people accessing basic services like hospitals and job centres, causing social isolation and inequality. It is also perpetuating the dominance of cars, exacerbating toxic air pollution and climate emissions. Apart from Lothian Buses and a few other exceptions, most of Scotland’s buses are privately run, meaning that too often profit has been put before people. The Government is consulting on plans which will enable local transport authorities to run their own bus companies. This will allow for a shift in the balance of power away from private companies and towards public bodies, and could potentially could see more bus companies as successful and clean as Lothian Buses start to emerge across the country. We are supporting the Government’s proposals to allow transport authorities to run their own bus operations or operate highly regulated franchises, which would allow transport authorities to control fares, and design and map out routes which serve the public better so that that bus services work for people rather than just for profit. We’ll be pressing for the proposed changes to be brought forward into the Transport Bill and taken up by local councils, including in Glasgow. £39m each year to be invested in walking and cycling, which equated to a measly 2% of the total Transport Budget. Money matters: by prioritizing building roads so heavily over creating cycle paths and pedestrian spaces, the Government has been maintaining cars as the dominant mode of transport. Investment in bigger roads directly undermines efforts to tackle climate change and our air pollution crisis. The Scottish Government will “double investment in walking and cycling to £80m a year”. This is still far short of 10% of the total transport budget, but it is a significant increase and a signals a step change in the Government’s view of the importance of walking and cycling paths. Ambitious active travel proposals from Edinburgh, Glasgow, Stirling and Inverness were all granted funding to go ahead – the expectation was originally that only one would be funded. The projects include plans for a “Mini Holland” right through the heart of Glasgow City Centre which we are very much looking forward to seeing come to fruition. 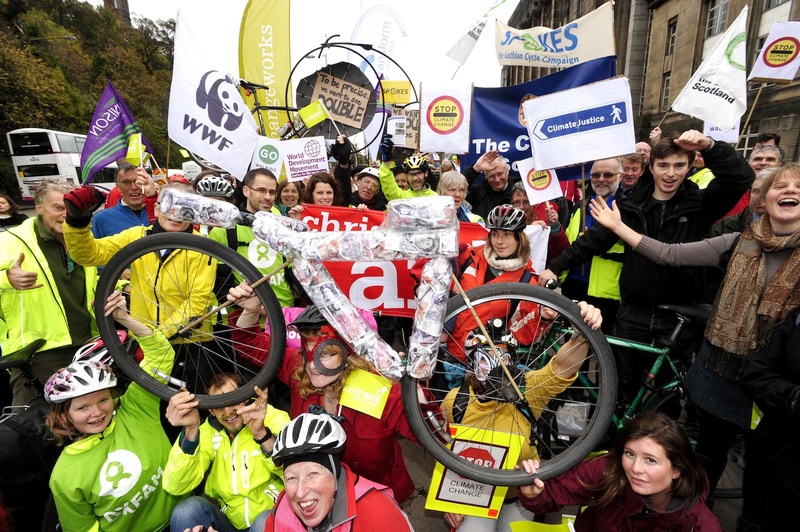 The increase in the active travel budget comes years of grassroots and coalition campaigning from all corners of the environmental movement from the volunteer-led Pedal on Parliament, to We Walk, We Cycle, We Vote, to Stop Climate Chaos Scotland. We need to make sure that projects are delivered on the ground, to be able to make the case for even more funding for cycling and walking schemes. Now more than ever, it is important to show support on the ground for budding cycling paths and/or pedestrian spaces. The transport sector would be decarbonised by 2050. This is a step forward, but it is technically difficult (though not impossible) to deliver. The Scottish Government does not have the powers to control vehicle taxes like “Vehicle Excise Duty”. If it did, it could tax petrol and diesel cars much more heavily than electric cars, and this would speed up the transition away from fossil fuel vehicles. So we instead are pressuring the Government to put a more creative set of measures on the table. We need to be careful that electric cars are not seen as a panacea that will solve Scotland’s transport woes. Electric cars do nothing to tackle congestion and they do not help the 30% of households in Scotland that do not have access to private cars. The truer potential for making transport cleaner and fairer is via enabling more of us to walk, cycle, and use public transport. So we have a task now to make sure that the Scottish Government does not get too narrowly focused and invest all of its ambition on transport onto this promise. Let’s not be under any illusion that we are close to where we need to be on sustainable transport. But we can be buoyed by the recent commitments, and use them to strengthen our calls for clean air. We’ll be working hard in the weeks and months to come to ensure that promises turn into ambitious policies. You can support this work with a small donation.